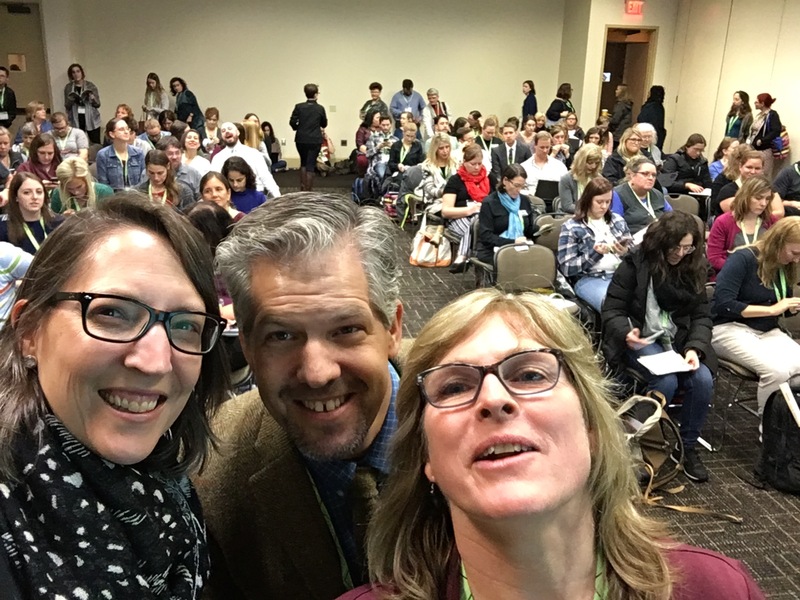 Saturday night at NCTE to read poetry, workshop poetry, and talk about writing? Going to Fountain of the Muse was the best decision I made today. invites us to change 5% of what we’re doing per year. Not changing everything at once. because I’m not totally happy with how independent reading is going in my classroom. or reading graphic novel after graphic novel? I don’t have my own classroom. Nor can I be assured of being in the same classrooms from year to year. It’s impractical to build a classroom library. to get books in students’ hands: pop up library, mobile library carts. First rule of assessing readers: do no harm. that might get in the way of students finding the best books for them. book club meetings with food. Be a champion for authentic reading in your classroom. in spaces you share with your colleagues. They had a growing dissatisfaction with rubrics. They wanted a more meaningful relationship with writing and revision. and less about decisions you have to make in the world of grades. I knew I was among my people. and their perceptions of themselves as writers? as real writers and where there is enough trust to take risks? a unique list for each class. DO NOT TURN IT INTO A RUBRIC. How can we embed opportunities to develop independence and writers’ voices? My students want it to be about growth. Every time I’ve asked, they are in consensus. So I tend to side with my students. for whoever looks at the transcript, right? I’m not so interested in that business. and not the ones who might look at a grade at some point in the future? because of a number they’ve given them. to make it work for you. Then responding with care (thank you). and be who we are. This entry was posted in #NCTE17, #StopGrading, gradebook, gratitude, making change, not grading, presenting, things made of awesome. Bookmark the permalink. Always love hearing your thoughts on grading / responding to student writing. This entry struck me, too, about risk-taking and authentic reading & writing tasks. My new mantra is “teacher behavior precedes student behavior.” What actions, thinking, modeling has to happen from/by the teacher has to happen to open the door for students to take risks? Is it in how we establish a learning environment? Task development (writing that we ask students to read, respond to, and in asking what kind of writing they’ll produce)? Is it in our modeling of our own thinking, response to readings, writing? How do we plan — or maybe envsison is a better word — for risk-taking to happen in our classrooms? Or is it organic? Thank you!